Refine searches by multiple criteria, including name, content, and kind. Search multiple locations on your Mac. Easily exclude locations to cut down on search time. Use Find by Example to help build complex search queries. Create snippets and templates to reuse in future searches. Only Spotlight indexed files are searchable. 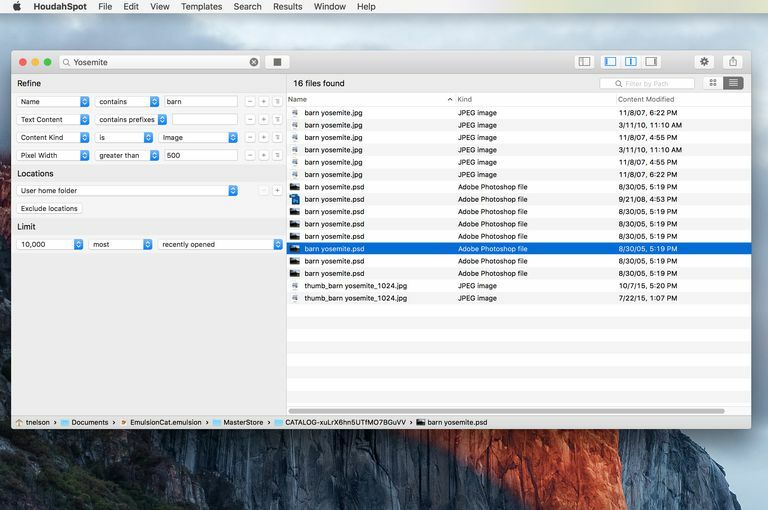 HoudahSpot 4 from Houdah Software is a highly customizable file search service for the Mac that works with Spotlight to help you find items on your Mac. What sets HoudahSpot apart from Spotlight is its powerful filtering technology, which can sift through Spotlight results, and return much more targeted results that are far more likely to lead to actually finding the file you're looking for. HoudahSpot is a front end to the Spotlight search engine already built-in to your Mac. This is important to understand for a couple of reasons. First, HoudahSpot can only find files that have been indexed by Spotlight. For the most part, this will be every file on your Mac. However, it's possible for a third-party developer to create file formats that don't include support for Spotlight, which could render those files invisible to Spotlight and HoudahSpot. The other type of file you won't be able to find are those that Apple has decided that Spotlight doesn't need to index; for the most part, these are system files hidden within the OS. HoudahSpot won't be able to search for these hidden files, either. This isn't much of a drawback since HoudahSpot would have to build its own file index in order to search system files. That would be quite a burden, both in forcing the user to wait around for HoudahSpot to perform indexing and the sheer overhead of having to duplicate what Spotlight already does, building a search index. HoudahSpot opens as a single-window app, displaying two main panes: the search pane and the results pane. You can add two additional panes to the display: a sidebar for easy access to search templates and snippets you create, and an info pane for seeing details about a selected file in the search results pane. Along the top of the window is a toolbar that includes a general search field. This is the basic starting point for using HoudahSpot. HoudahSpot will search for files that match any portion of the search term you enter in the field. This includes file names, contents, or any metadata within the file. As you can imagine, there can be quite a few matches. Narrowing down the results is what HoudahSpot does best. The search pane is where you refine your search to focus on the file you're looking for. You'll find the usual methods for refining a search, such as Name Contains, or Name Begins. Or, you can search on Text contains a specific word or phrase. You'll also find the usual “kind” options, that is, the file is a jpeg, png, doc, or xls. So far, this is fairly basic, something Spotlight can do as well. But there are a few more tricks up HoudahSpot's sleeve, including specifying locations to search, such as your home folder, as well as excluding locations, such as your backup files. You can also specify limits, such as only showing the first 50 matches, the first 50,000 matches, or just about any amount you wish. But one of HoudahSpot’s real strengths is that it can search on just about any metadata item associated with a file. For example, you want to search for a logo you were working on, but you want the version that is 500 pixels wide. Or how about a song, but only at a certain bit rate. Being able to narrow down your search by any bit of metadata that may be contained in a file is extremely helpful. Even more so is the ability to combine search filters in just about any way you wish. Search filters are created using simple drop-down menus and, where appropriate, a field or two to enter data in; the entire process of creating filters is simple. But if you're still looking for an easier way to make your search filters, you can always create them by example. In this case, you drag a file that you know is similar to the one you're looking for to the search pane and one of its search criteria, and HoudahSpot will use the information in the example file to populate the search filter. You can then refine the terms a bit further if you wish, but using example files is a great way to get started. Finally, any search criteria you create can be saved either as a full template that contains all search criteria, or a snippet that may contain just a couple of terms. This way, you can quickly reuse search terms for common searches you perform. HoudahSpot displays search results in the left-hand pane, either in a list format or a grid. The grid is similar to the Finder's Icon view. The list view allows you to specify columns and control how the results are sorted by your chosen criteria, including kind, date, and name. Just like the Search pane, you can use any metadata type a file has as a column to be used in sorting. So, for example, you can include columns for bit rate or pixels. The Search Results pane supports Quick Look, but if you're looking for more information, you can open the Info pane, which displays additional information about a selected file. Think of this as similar to the Finder’s Get Info, though with quite a bit more detail. HoudahSpot is as quick as Spotlight but much more versatile. Its ability to create complex search filters without a great deal of effort is remarkable, and more importantly, will actually help you refine a search and quickly lead to the one specific file you're looking for. HoudahSpot 4 is $29.00. A demo is available.